and Ground Duty (Non Technical) branch. Mode of Application is Online. Registration of Online Application process will open from 01-12-2018. Registration of Online Application process will close on 30-12-2018. EKT and AFCAT/NCC/Meteorology Entry-2020 will be conducted in Feb/March 2020. Candidates will be selected through Written test and medical tests. Commencement of courses Jan, 2020. 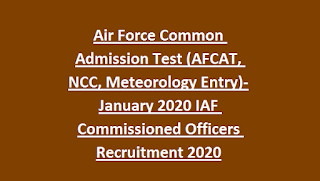 All details of Air Force Common Admission Test AFCAT -January 2020 Commissioned Officers Recruitment in Flying, Ground Duty Branches mentioned below. Qualification: 3 years Graduation degree in any discipline OR BE/B.Tech. Age Limit: 20 years to 24 years as on 01st Jan, 2020. Qualification: 4 years Graduation degree or integrated post Graduation Qualification in Technology or Engineering with 60% of marks in maths, physics at 10+2 level. Age Limit: 20 years to 26 years as on 01st Jan, 2020. Qualification: Qualification for Accounts must be B.Com. ; Qualification for Education must be MBA/MCA or M.Sc./MA degree in physics / English/ Chemistry/ Statistics etc. Qualification for Administration, Logistics is Graduation degree in any discipline from a recognized University. 1. It will be through AFCAT-January 2020, EKT (Engineering Knowledge Test)-2019 which will be conducted on February, 2020. 2. AFCAT-Jan 2020 will be of 2 hours duration with objective type questions on verbal ability, numerical ability, reasoning, military aptitude and General Awareness. 3. EKT- January 2020 would be for 45 minutes and it will be held immediately after AFCAT- Jan 2020. 4. 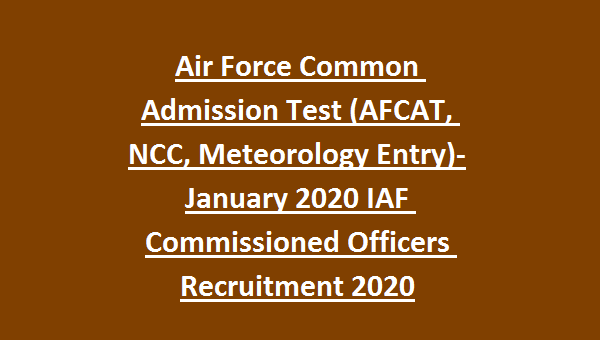 Short listed candidates of AFCAT- January 2020, EKT-2019 will be called for another test at Mysore or Dehradun or Varanasi or Gandhinagar or Kanchrapara. For Flying branch, test will be conducted in Mysore, Varanasi and Dehradun only. 5. This test consists of 3 stages. a) Stage I: It is a screening test and those who qualify will go for subsequent tests. b) Stage II: It consists Psychological, group test, interview. c) For Flying branch: CPSS would be Administrated for eligible candidates which is a Computerised Pilot Selection System. AFCAT Question Paper Consists of 100 Questions and each question carries 3 marks. If candidates meet above eligibility conditions, click on "candidate login" in career section of IAF Website www.careerairforce.nic.in Follow all instructions and fill the form. Registration of Online Application process will close on 30-12-2018.